Born on 2 May 1894 in Manchester, England - brother of Miss Mary Wright, Stokenhurst, Rinkchall[? ], England - at the time of his enlistment in 1915: trade as labourer; single; no current or previous military service; Roman Catholic; height of 5 feet 8 inches; chest of 34.5 inches fully expanded; ruddy complexion; blue eyes; blonde hair. 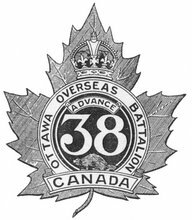 Joined the 38th Battalion, CEF, in Ottawa, Ontario, on 1 May 1915 (number 410231) - served with the 38th Battalion during its period of garrison duty in Bermuda - struck off strength to Headquarters, 12th Canadian Infantry Brigade, CEF, on 10 or 12 August 1916 - transferred to Headquarters, 4th Canadian Division, CEF.